Getty ImagesSerena Williams at the royal wedding service with husband Alexis Ohanian. Serena Williams headed to Meghan Markle‘s and Prince Harry‘s royal wedding after-party this weekend wearing a pair of sneakers. Williams is representative of a growing movement in women’s fashion toward swapping high heels for more comfortable shoes. Sales of high heels suffered in 2017, declining by 11%, according to NPD Group’s Retail Tracking Service. Meanwhile, women’s sneaker sales were up 37% in the same period. 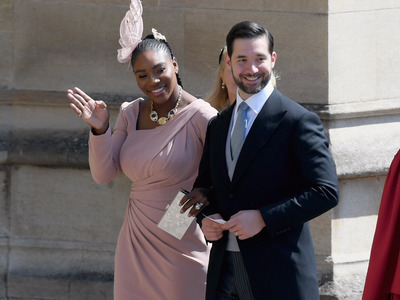 US pro tennis player Serena Williams made a major fashion statement at the royal wedding of Meghan Markle and Prince Harry this weekend. Williams, who was invited to attend the church service, afternoon reception, and evening party, admitted to slipping into a pair of sneakers for the evening part of the celebration at Frogmore House on her social media pages. “Little known fact: I often wear sneakers under my evening gown,” she captioned an Instagram post that showed the sneakers. Williams’ footwear choice is symbolic of a growing movement in women’s fashion toward opting for comfort over anything else. Casualization is sweeping the industry as women choose to dress down and switch out constricted clothing for athleisure wear. For many, this also means trading heels for sneakers. The casual trend has even made its way into one of the most traditionally formal items of clothing, the wedding dress. In 2017, sales of high heels declined 11%, according to NPD Group’s Retail Tracking Service, CNBC reported. Meanwhile, women’s sneaker sales were up 37% in the same period. There may be other reasons for this trend, however. In December,The New York Times investigated why high heels have fallen out of favour for many women and concluded that it could be linked in part to the #MeToo era and reports of sexual harassment. Women are choosing to dress for themselves rather than being sexually appealing to men. Moreover, flat shoes enable women to escape from dangerous situations. “You only need to spend a few minutes on the internet these days to see that, yes, there are quite a lot of times when, unfortunately, it would help to be able to run,” Renee Engeln, a professor of psychology at Northwestern University, told The Times.